Managing a vast collection of recipes used to be as simple as pulling out a box of index cards. Now things are a little smarter, but that also means they're a bit more complicated. To wrangle all your recipes into a sensible order on your iPhone, we like Paprika. 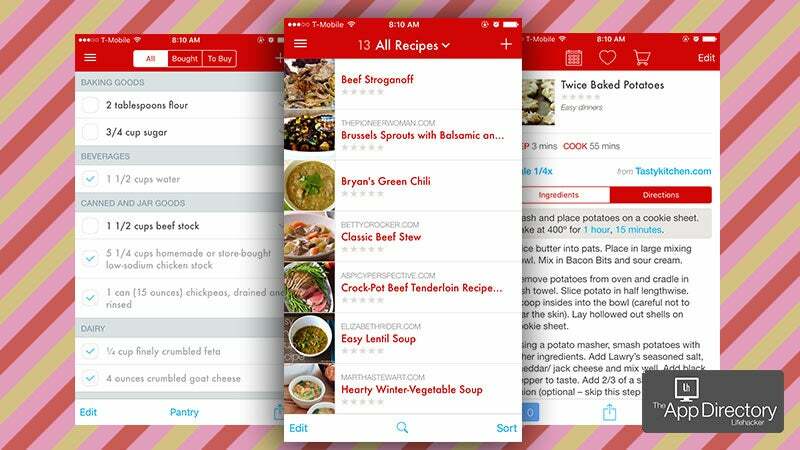 Paprika does just about everything you could ask for in a recipe manager. Using either Paprika's built-in browser, a Safari share extension, or a bookmarklet, you can import recipes from online sources into Paprika's easy-to-read recipe format with just a couple taps. Once you have your recipe book built up, you can sort them into a variety of categories, add notes, or search through them by ingredient or name. As far as cooking with Paprika goes, the app has timers inside the app that can be turned on from the directions themselves. It also allows you to scale recipes up or down so you don't have to work your maths muscles trying to remember how many tablespoons are in a 1/4 cup. If you're cooking a big feast and need to swap between several recipes, you can "pin" up to three recipes at once to make swapping between them a little easier. Paprika also features a robust meal planning system where you can plan your meals out for a week or month. You can then share that plan to your calendar so the whole family can see what's on tap for dinner. Paprika can even build a grocery list based on the recipes you chose, subtracting out base ingredients that you already have in your pantry. What also sets Paprika apart from other similar options is its syncing capabilities. Paprika can instantly sync between devices with a free Paprika account. Since Paprika syncs to its own account and not an iCloud account, it's easy to share lists with multiple family members. If Paprika falls short in anything, it's in the price. The iPhone app is not universal, so if you want to also use Paprika on your iPad, you'll need to shell out an additional $7.99. Worse, the (arguably not necessary) desktop app sells for $30.99, so the total investment for all platforms is nearly $50. Of course, most of us don't need all the different apps, so the point may be moot for many. Paprika's also one of the only recipe managers on iOS and Mac, so while it is expensive, it could also be seen as a selling point for some. This is especially true if you plan on typing out your own hand-written recipes. While Paprika has a recipe search function, it's essentially Google in a Safari window, so it's not really made for discovery. Paprika relies on you to find the recipes and store them in the app as opposed to guiding you to different meals. When you first start up Paprika, it's empty, so you're starting from scratch with no simple database to build from. If you're just trying to get some help figuring out what the heck to cook tonight, Paprika is not for you. Paprika's main competition comes from Basil ($7.99). Unlike Paprika, Basil is a universal app, so one purchase gets you both the iPad and iPhone version. The app is limited to iOS though, so if you plan on leaving iOS or you want to sync up with family members who have a different operating system, Basil's not for you. However, as a recipe app, Basil goes toe-to-toe with Paprika in nearly every major feature. It can automatically import recipes from a variety of web sites, has time-based directions with slick in-recipe timers and has a simplified interface that's easy to use. Basil even outdoes Paprika with its auto-tagging system that organizes your recipes for you without you having to do a lick of work. For me, the big letdown with Basil comes from the lack of a bookmarklet, which means if I find a recipe online, I have to send the link to myself, open it up on my iPhone, then import it into Basil. If that doesn't matter to you, Basil's easily on par with Paprika in core functionality and well worth a look. For free options, Pepper Plate (Free) does a lot of what Paprika and Basil do, but isn't nearly as easy to use. The core functionality is there though, and Pepper Plate does allow you to import recipes from a variety of sites and organise meal plans. If you don't mind using an app that's not as elegant as Paprika or Basil, Pepper Plate's worth trying out. If you're more interested in curated recipes, then BigOven (Free) does the job. Alongside the basics like a menu planner, grocery list and recipe clipping, BigOven also gives you access to around 350,000 recipes in the app as well as a scanner for handwritten recipes. The app is ad-supported though and restricts how many recipes you can scan yourself, so you'll have to deal with the ads or buy out of them for the obscene price of $30.99/year. Finally, Yummly (Free) is worth a look if you're not too interested in bringing in your own recipes. It can clip recipes from major food blogs, but it doesn't have the robust import options of Basil and Paprika if you go outside of Yummly's built-in directory. Yummly is great for browsing recipes though. It features big pictures and a pretty big database of recipes to hunt through. Lifehacker's App Directory recommends the best applications and tools across multiple platforms. I'm a long time user of Paprika and find it indispensable! My wife's cookbooks are really just for decoration now as she has rarely touched them since we started using Paprika years ago. We have a fridge iPad that we use for shopping lists and such, and Paprika falls in line so well.